Printable Black & White PDF Printable Color PDF More Paper Dolls & ClothesAll fashion styles (main-steam and not) go through evolution. The goth fashion of my teenage years is not the goth fashion of today. Sure, there is some similarities- lots of black, references to death, and corsets. However, like all fashion, it has trends like anything else. When I was younger, goth fashion was a lot of long flared skirts, corsets, crop tops to show off belly-button rings and boot-cut vinyl pants. Today’s goth fashion (as far as I have observed) is a lot more leggings, tunic tops and large picture hats. 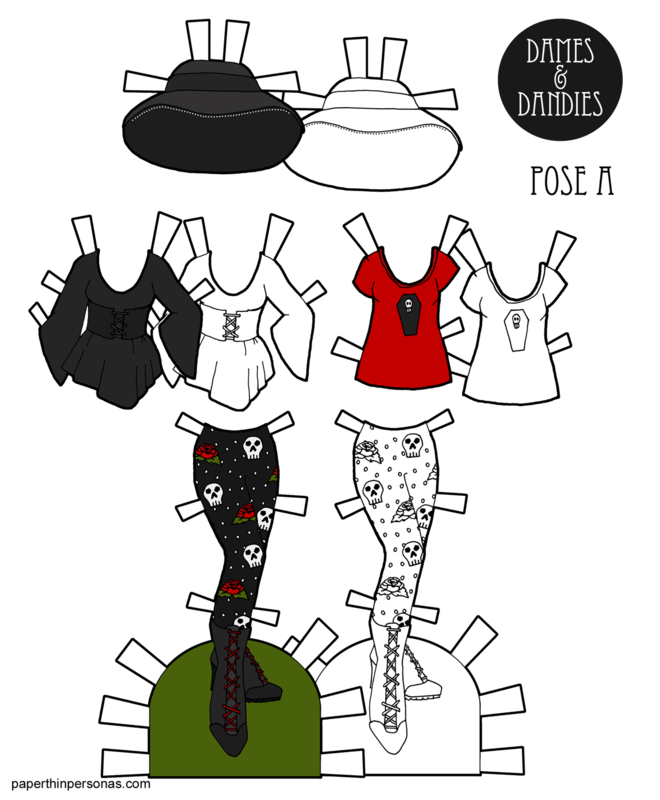 So, I wanted to capture that when I was designing today’s set of goth paper doll clothing. The first challenge was the leggings. A lot of Gothic style leggings are heavily patterned. I chose skulls (something I’m not great at drawing) and roses to go on mine with a background of polka-dots. Conceptually, I wanted the shoes to feel a bit Victorian boot like, but I’m not sure I succeeded in that. I think I should have made them more chunky. The blouse is based on several I saw online, primarily this one. The hat comes from images like this and this. I wanted it to be clear that the corset belt it part of the blouse, not a separate piece, but I’m not sure I succeeded. Frankly, this whole set is one that I feel like I could have done better on. The red shirt with the coffin was really my attempt at a gothic t-shirt that wasn’t a band reference, a pentagram (I have several pagan friends and I try not to depict religious symbols in my art that aren’t my own) or a sarcastic saying. Lettering is challenging at the scale I tend to work at. I made the shirt red, so I could make the coffin black. Otherwise, you can’t really tell it is a coffin. And on the coffin is a wee little skull. So, that’s how I ended up with today’s goth paper doll fashions. All right, so how did I do with my goth fashion attempt? Are there any goth fashion affection-adios out there who can tell me if I am totally off the mark? Let me know in a comment. And if you love the blog and want to support it, I’m always happy to get more Patrons. You can sign up here. This feels like something Delia from Beetlejuice would wear if she was a teen today! Love the hat – can’t keep that deathly pale complexion without it! !